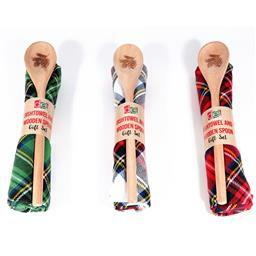 COTTON TOWEL WITH WOODEN SPOON PLAIDS SET. The perfect hostess gift! Wood spoon features engraved pinecone and comes packed with a plaid dishtowel. 3 DIFFERENT STYLES GREEN WHITE OR RED. CALL 800-743-9790 TO SEE WHAT IS AVAILABLE. PRICE IS FOR ONE TOWEL AND SPOON SET.